Sometimes I forget how many vegan options there are in Westchester and the Lower Hudson Valley. Lalibela in Mount Kisco is an example of this. There was a time when I got to go to Lalibela every now and then for lunch, but then time got away from me, and I went for a long stretch without getting to go. 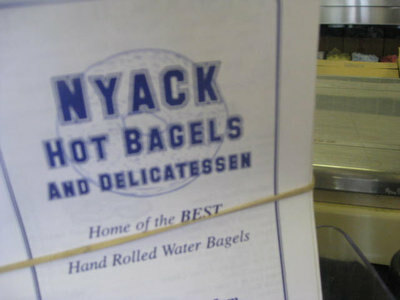 Fortunately, The Westchester Veggie EatUP group had an outing there last week, and I found myself with the time to go. I am so glad that I did! 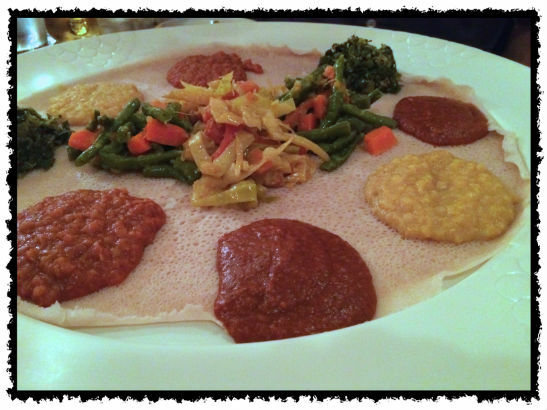 Ethiopian food is a real treat, whether you’re a plant-based eater or not. many of the dishes (well, I can only speak for the plant-based ones) have a background of cumin, coriander, cinnamon and cardamom, among others spices. Many of the dishes also use berebere, a hot spice blend including chiles, paprika, ginger, coriander and cinnamon. The varying dishes tend to have a different level of heat, bringing a different flavor to dishes with similar base ingredients. Take the dish below. You’ll notice two red dishes next to each other: one is Misir Wat, the other Miser Wat Alicha. Both are red lentil dishes with one layer of spice that is the same, but one with the spicier blend as well; they’re like two entirely different dishes. The yellowish dish is another that might look like it is very similar, like the less spicy lentil dish but made with split peas. It’s a dish with its own personality. 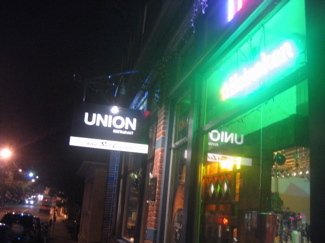 The dish above is a sampler of all of their regular vegetarian dishes. You can opt for less, however. A smaller selection of dishes at lunchtime. The dishes are really meant to be shared with another person. You can choose 1 or 2 dishes, and they can also be served family style on the injera bread (the pancake-like spongy bread the dishes are served on, as well as along with). This particular picture is somewhat old, and I don’t see those beets on the menu now, but I don’t remember seeing it on the menu at the time, either. It may have been a special! Fun things to know: you won’t see utensils on the table. 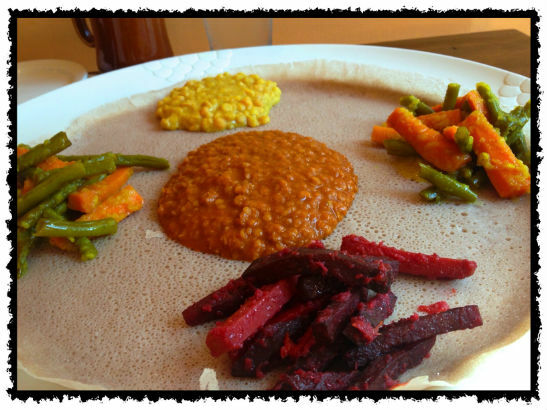 Yes, they do have them and you can ask for them, but this type of food is meant to be eaten using the injera and your hands- nothing else! It’s messy, but fun. Also, you might notice that in other areas, there are Ethiopian restaurants named Lalibela (I used to frequent one in New Haven, CT). They are not related; it’s the name a of a town in Ethiopia. So, it’s a great place to go either for lunch of dinner. Best to go with others, as the plates are meant to be shared, though you can certainly go on your own. They were able to accommodate the group I went with last week, which was around 15 people. Oh, and I did I mention the raw vegan cheesecake they had? Wish I had a picture, but I forgot myself and just ate it. Delicious!